The Syndicate tests the spreading of the smallpox virus carried by bees on a South Carolina town, with packages sent from Canada. Right before the test, a damaged package is rerouted to Virginia, where it causes the death of a postal worker. In exchange for a cure for Scully’s cancer that never comes, Skinner does the Cigarette Smoking Man’s dirty work and covers up and destroys all the evidence tied to that death. The CSM takes advantage of the situation to create a precedent for blackmailing Skinner by killing a police officer. Skinner digs deeper into the bee case and meets Marita Covarrubias. Mulder clears up evidence against Skinner and Marita is revealed to answer to the CSM. Zero Sum is not a Carter episode, it was written by Gordon & Spotnitz — but Carter & Spotnitz must have developed the core of the mythology from the beginning of season 4 all the way up to Fight the Future. The bees story aspect is one of those threads; they were introduced in 4X01: Herrenvolk by Carter and here we are given hints at what their purpose might be (all this leading up to the revelations in Fight the Future, the story of which belongs to the same team Carter & Spotzy). Much screen time with the tortured character of Skinner here, just like 3X21: Avatar in season 3 — perhaps they were planning to center one episode per season to him. What for? Mulder theorizes: “somebody is trying to engineer a method of delivery, for a disease that has killed more people throughout history than any other contagion known to humankind“. Smallpox was indeed one of the deadliest — that is until the Black Oil plague is released. In the hospital where the emergency is dealt with, military personnel are seen: they don’t have any ties to the Syndicate, they are there just because of the seriousness of the outbreak — indeed smallpox is considered extinct since 1979. 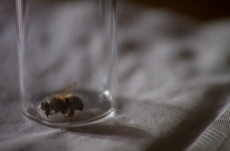 Skinner suspects this is “some kind of experiment […] using bees as carriers“. At this point it’s unclear what this experiment’s end purpose is about, but in light of Fight the Future, we can say that this is a test in real conditions of the efficiency of the bees as a means to carry and spread a virus in the population. First Elder: “Should we assume that the trial run is proceeding as planned?” The smallpox is only a reference disease; the nature of the disease itself is unimportant, as long as it is deadly. What is tested is the capacity of the bees to effectively infect the entire population with the disease. After this “trial run“, the bees are confirmed as the transport vector for the virus; the production of Black Oil virus-carrying bees can go forward (Fight the Future). Also, corn is chosen to replace ginseng. We are reminded of the case of 2X22: F. Emasculata, where the CSM seemed to be behind another viral outbreak, this time using insects and parasites from Central America instead of bees and variola; F. Emasculata can be seen as a previous trial run to determine the best transport vector. The bees carry a more virulent strain of variola (which is another name for smallpox), with an extremely short incubation period (Dr. Linzer: “Smallpox has an 8-day incubation period, and these kids were stung just a few hours ago.“). This strain was artificially created, quite possibly by a team lead by variola specialist Dr. Charne-Sayre (4X10: Terma). The ginseng in the Canada farms (Herrenvolk) had to be appropriately mutated to carry the virus, and the virus itself mutated to increase its deadliness. By natural pollination, the bees take the virus from the ginseng flowers and carry it with them; the virus eventually makes its way inside their organisms, until ultimately it is to be found in their venom sacks and stingers. This is not unheard of: the transfer of genes from GMO crops to microorganisms living inside bees’ abdomens has indeed been observed and documented! Dr. Charne-Sayre must have been responsible for the further engineering of a plant carrying the Black Oil virus. We never learn what species these bees were, but they are very aggressive and attack in large swarms. Dr. Valdespino: “Any kind of bee can be lethal, provided you get stung by enough of them. Even africanized honey bees, the so-called killer bees, basically have the same venom as the European honey bee. It’s just that they tend to attack in swarms.” As evidenced by their swarm behaviour, these could be ‘africanized’ bees. Once again, XF use the phobias of modern America to tell scary stories. Around the late ’90s, fear overtook Americans (by that I mean the people of the United States) and the media that swarms of killer bees were approaching the USA from the South (from Mexico, Central and South America, that is — the ‘other’ America, the ‘rest’); their provenance would have been Africa (and that’s no America at all), hence the ‘africanized’; but in the end, no attack was reported… And, as evidenced by Dr. Valdespino’s tragic death in his own lab, these bees develop tremendously fast, going from larvae to swarm in a matte of hours. 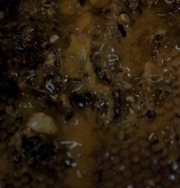 Honeycombs containing bee larvae were sent from Canada to the test site (Payson) through the normal post. One of the packages was damaged in transport and was sent to the Transcontinental Express Routing Center in Virginia, which apparently centralises packages for the entire East Coast. The package was to be processed there, but because of the damage, the bees hatched and spread out in the package’s storage room and essentially turned the wall into a small apiary, complete with honeycomb and royal jelly. The room adjacent to the storage room was the ladies’ room, where the nicotine-addict postal worker was attacked (smoking is lethal, CSM beware). This kind of exposure could link the Payson outbreak to the Alberta farms and it is in the Syndicate’s interest to silence it. 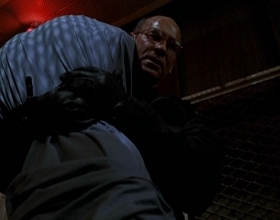 In 4X15: Memento Mori, Skinner started a bargain with CSM “so you [Skinner] could have what you wanted: a cure for Agent Scully.” Under the CSM’s orders, Skinner does all the dirty work of cleaning up the crime scene, disposing of the victim’s body and replacing the blood that would have indicated a smallpox infection with normal blood — posing as Agent Mulder. A connection can be no longer made between this death and the “trial run” of South Carolina. The CSM has the Grey-haired Man further execute the police detective that had started looking into the case and had sent the info to Mulder; the Grey-haired Man used Skinner’s gun to do the deed. At any time, the CSM can have Skinner’s gun tested and prove his guilt: the CSM creates a sword of Damocles over Skinner. Skinner messed with the Devil, he finds himself even more in trouble (CSM: “A man digs a hole, he risks falling into it.“). However, after being in doubt, Mulder is convinced of Skinner’s innocence and erases the serial number from Skinner’s gun so that nobody can trace the murder to him. Skinner is more than ever the CSM’s desperate pawn. 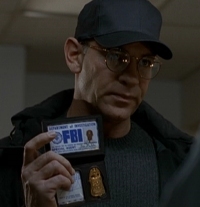 In the end, Skinner threatens the CSM to kill him but just like Mulder had hesitated and lowered his gun in a previous confrontation (2X08: One Breath), Skinner doesn’t shoot — he has the small satisfaction to shoot towards CSM nevertheless… Despite all this, the CSM still claims that he will keep his end of the deal (“Agent Scully stands to live a long and healthy life.“). The CSM’s credibility isn’t that good among the Syndicate Elders, especially after the obscure story of the digital tape and Melissa Scully’s killer (3X02: Paper Clip, 3X17: Apocrypha). The CSM is dismissive (“It’s been taken care of. The details are unimportant.“) but the First Elder is particularly harsh on him (“Details are everything. Much more important than your vague assurances.“). X’s executioner the Grey-haired Man was last seen in Memento Mori; he seems to have been promoted to the CSM’s personal bodyguard. Given what happens to the CSM shortly afterwards (5X03: Redux II), the Grey-haired Man won’t be seen again. After her introduction in Herrenvolk, little is known how deeply wired in Marita Covarrubias is. It turns out she is to some extent mingled with the Syndicate’s affairs. She does play a double role: On one hand, she tries to have Skinner investigate harder and go public with everything he knows on the bees (“If you know who’s behind this, you have to come forward, Mr. Skinner. No one else can.“), and on the other she’s in touch with the CSM, perhaps answering directly to him. It appears that Marita has been the Syndicate’s contact in the UNO for some time, being both aware of the Syndicate’s actions and occupying a place high up in the UNO hierarchy. She goes to South Carolina because she knows Skinner knows about the experiment, though she pretends she found out about this from Skinner: “Your call about those bees prompted me to make some inquiries. […] My office has to answer to the Secretary General of the United Nations. This is a very serious matter. I need to know what’s going on.” She won’t admit any knowledge or involvment with the Syndicate to Skinner; she’s cautious enough to reveal her true motivations only to Mulder. On the CSM’s final phonecall to Marita, after Skinner has given the CSM a good scare, the CSM allows Marita to let Skinner in on a minimum of background concerning this shady business Skinner got involved to (Marita: “I’ll tell him [Skinner] what you want me to tell him.“). Someone else is hearing the consversation in Marita’s office; most likely it’s the Grey-haired Man, checking on Marita and making sure she’ll keep her allegiances. Even if she’s central to the drama in this episode, we see no Scully here. She’s in the hospital, “undergoing some imaging tests“; “her tumor may be metastasizing.” Three episodes later, it has indeed (4X24: Gethsemane). Thanks to this cancer arc, season 4 increased much the number of mythology episodes compared to last year.